Dr Steven Pace is 27 and farms near Congleton, Cheshire. The farm comprises 162 hectares (400 acres) of mixed arable and grassland. Dr Pace has a PhD in laying hen nutrition from the University of Leeds. Egg production: We have always been involved with farming, with my great grandmother setting up the egg enterprise in 1933. Egg production can be a technical and precise operation, which is fine for me, as it suits my scientific side. When I heard about the NFU/ABN’s Poultry Industry Programme I knew I had to apply. 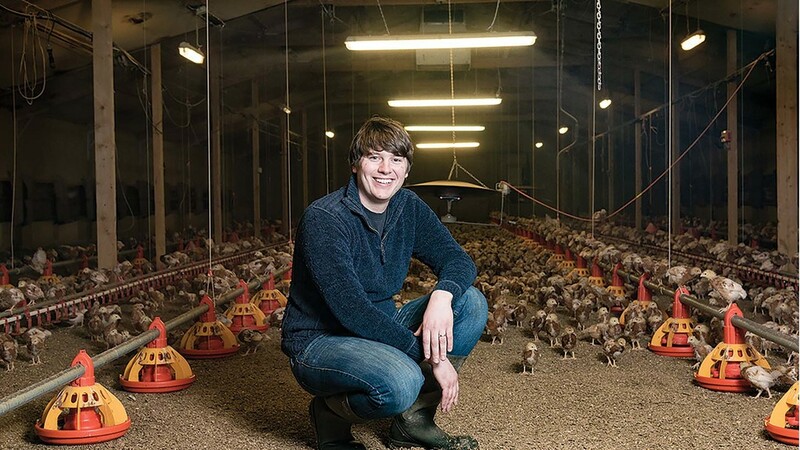 It is a scheme for 20- to 35-year-olds which gives young farmers like me the valuable chance to get first-hand knowledge from poultry industry peers and experts. Training: I had the opportunity to undertake specific training one cannot always get first-hand on-farm, such as an understanding of market trends and industry pressures, teamed with learning about cutting edge technology. Winning the Egg and Poultry Industry Conference’s Young Poultry Person of the Year award at the end of the programme was a pleasant surprise. Part of my submission for this helped combine my passion for poultry with science and avian disease – a hot topic for any poultry farmer, especially given the recent case of avian flu and Defra’s announcement about the housing of free-range birds. Disease: Avian diseases can present many problems for farmers, not least the possibility of large culls and the resulting huge financial losses. But there are many things a farmer can do to offset against this threat by practising good biosecurity, being vigilant and prompt reporting of any concerns to their private vet. Biosecurity: Keeping an eye on foot dips, making sure vehicles are disinfected and reducing site access are just three things which can improve biosecurity. Good biosecurity is absolutely key, particularly given the unprecedented threat we face. Not only farmers, but anyone connected with farms has a part to play here. From sales reps, pest controllers and feed trucks, everyone should be alert to stop disease from spreading. The advice also equally applies to keepers of backyard flocks. The NFU is already involved in providing workshops to inform and educate farmers about reducing the risk of avian diseases spreading. I hope these continue and grow in attendance to help spread the word there is more we can do to tackle this ever-present threat.